EXTRA TRAINS ARE to be provided by Irish Rail for the papal visit later this month. 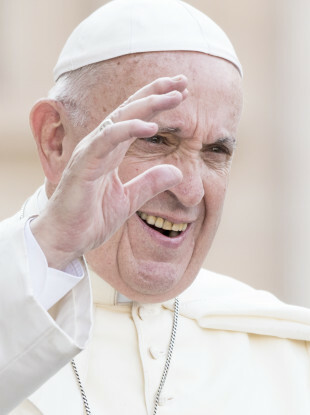 The transport provider said it will provide capacity for up to 250,000 journeys for those travelling for the Papal Mass in Phoenix Park on Sunday 26 August, as part of the visit of Pope Francis for the World Meeting of Families. Extra trains will operate to/from Dublin on all Intercity routes, and a high frequency of DART and Commuter services will operate also. There will be free travel on all public transport within Dublin on Sunday 26 August for anyone attending the event. There is no car park where attendees will be able to park up and walk to the event in the Phoenix Park. The event organisers have secured additional car parking for this event but these car spaces are for those availing of Park & Ride facilities. Irish Rail said today that advance booking of Intercity train tickets is mandatory for the Papal mass on Sunday 26 August. It said this applies to regular services, and extra trains which will operate from Cork, Kerry, Limerick, Galway, Mayo, Sligo, Rosslare and Waterford to Dublin on the morning of 26 August, returning in the evening. It said that Intercity train tickets will not be available for sale on the day and that there will be no access for anyone to Intercity trains who does not have a ticket or reservation. Irish Rail said that for existing ticket holders, including free travel pass holders and season ticket holders, an advance reservation is essential for travel on Sunday 26 August. Reservations for this date are free of charge, and can also be booked at the Irish Rail website. They will not be available at stations. Trains will have unallocated seating. Please take any available seat on your train. Extra DART and Commuter services will operate on Sunday 26 August before and after the papal mass. The National Transport Authority has announced that holders of tickets to the Papal Mass travelling in the short hop zone (that means DART, and between city centre and Balbriggan, M3 Parkway, Kilcock, Sallins, Kilcoole) can avail of free public transport on this date. Connolly Station and Tara Street Stations are the closest points on the DART network to Phoenix Park – commuters can also transfer at Connolly for trains to Ashtown, for closer access to Phoenix Park. Customers travelling from Connolly are advised to alight at Ashtown Station, for access to the Phoenix Park. Connolly Station and Tara Street Station are the closest points on the DART network to Phoenix Park – commuters can also transfer at Connolly for trains to Ashtown, for closer access to Phoenix Park. It advised people to take account of the walking distance from the station to the Papal Cross, and allow time for this walk when choosing train times. There are over 6,500 car parking spaces in greater Dublin area train stations, including 1,300 spaces in M3 Parkway alone. An Iarnród Éireann spokesperson said Irish Rail looks forward to bringing people to the event. We cannot stress enough how essential it is for customers to book Intercity travel in advance – this will ensure that all can travel to and from the event in comfort. Irish Rail has also laid on special services from Westport, Ballina and Athlone to/from Claremorris for the Knock shrine event on Sunday 26 August, including a free Bus Éireann bus transfer to/from Knock. As with Intercity services to/from Dublin, anyone who wishes to travel on these services must pre-book their rail ticket. Even if you hold an existing ticket or are a free travel pass holder, you must reserve your seat in advance of the event. Full details on the Papal visit are available at the official website. Customers can book travel at: www.irishrail.ie or 018366222 and are advised to do so as soon as possible, as Irish Rail said that trains will sell out. Email “Extra trains to be put on for Pope's visit to Phoenix Park ”. Feedback on “Extra trains to be put on for Pope's visit to Phoenix Park ”.